Make yourself at home in one of the 95 air-conditioned rooms featuring refrigerators and microwaves. Complimentary wireless Internet access keeps you connected, and satellite programming is available for your entertainment. Private bathrooms with shower/tub combinations feature complimentary toiletries and hair dryers. Conveniences include coffee/tea makers and blackout drapes/curtains, and housekeeping is provided daily. With a stay at Baymont by Wyndham Galveston in Galveston (West End), you'll be within a 5-minute drive of Galveston Island Convention Center and Galveston Fishing Pier. 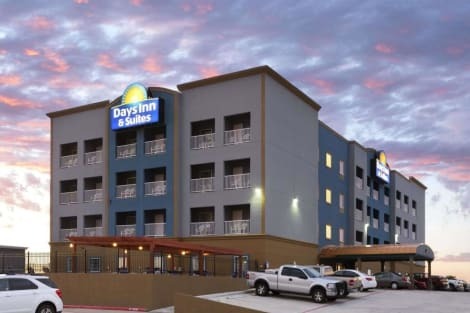 This hotel is 2.4 mi (3.9 km) from Galveston Schlitterbahn Waterpark and 2.6 mi (4.2 km) from Moody Gardens. 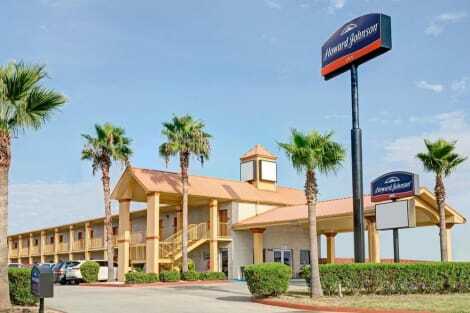 With a stay at Howard Johnson by Wyndham Galveston in Galveston (West End), you'll be within a 10-minute drive of Port of Galveston (Galveston Wharves) and Port of Galveston Cruise Terminal. This motel is 4.2 mi (6.8 km) from Moody Gardens and 4.3 mi (6.8 km) from Galveston Schlitterbahn Waterpark. Make the most of your beachside getaway by staying at our Rodeway Inn hotel in Galveston, TX. We are near the Moody Gardens, Galveston Convention Center and Texas A and M University. Every guest can take advantage of our free continental breakfast, free WiFi, free weekday newspaper and outdoor pool. Unwind in one of our inviting guest rooms, all of which feature a hair dryer, coffee maker and refrigerator. Also, earn rewards including free nights and gift cards with our Choice Privileges Rewards program. Featured amenities include a 24-hour business center, express check-out, and complimentary newspapers in the lobby. Guests may use a cruise ship terminal shuttle for a surcharge, and free self parking is available onsite. lastminute.com has a fantastic range of hotels in Galveston, with everything from cheap hotels to luxurious five star accommodation available. We like to live up to our last minute name so remember you can book any one of our excellent Galveston hotels up until midnight and stay the same night.